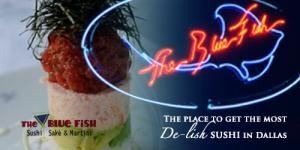 The Blue Fish has been serving award-winning sushi and hibachi in Dallas since 1998. We have now introduced full service catering options to bring our innovative and fresh menu concepts to "wow" guests at any type of event. We can even provide a sushi or hibachi chef to entertain guests as they prepare their creations at your venue. Our professional coordinators will set-up, assist the chef and your guests, as well as provide clean-up for added convenience. No matter what the occassion, Blue Fish Catering is the perfect ingredient for memorable moments. Cancellations received more than 48 hrs. in advance will not incure any fees. Cancellations within 48 hrs. will incure a 25% of total fee and cancellations within 24 hrs. will incure a 50% of total fee. There is a $300 minimum for all catering orders. Sales tax and gratuity will be automatically added to totals. Our expertly crafted sushi boat provides guests with an array of fresh sushi and sashimi options along with a variety of our gourmet signature rolls. Sushi, sashimi or combination: Salmon, tuna, yellowtail, snapper, albacore and snow crab. Signature Rolls: Rainforest- shrimp tempura and avocado topped with salmon, spicy tuna and scallions. Drizzled with eel sauce and spicy mayo. Firecracker- spicy tuna and cucumber topped with crab and tuna. Finished with wasabi cream and martini sauce. Blue Fish- salmon, yellowtail, tuna, avocado, cucumber and masago. Rock Manhattan- shrimp tempura, snow crab and jalapeno topped with tuna, crabstick, three types of caviar and tempura flakes. Served with sweet and spicy sauce. Ask how to upgrade this package with one of our executive sushi chefs and mobile sushi case. Let our sushi chef entertain your guests with preparation at your venue. Our professional coordinators will set-up, assist the chef and guests, as well as clean-up for added convenience. Cancellations received more than 48 hrs. in advance will incure no fee. Cancellations within 48 hrs. will incure a 25% of total charges fee and cancellations within 24 hrs. will incure a 50% of total charges fee. There is a $300 minimum for all catering orders. Sales tax and gratuity will be automatically added to total. Perfect for smaller parties or a great "introduction to sushi" package, The Warrior combines some of our most popular items that are sure to please a variety of palates. Package includes: Edamame Ahi Tower Chicken or Beef Skewers Tuna and Salmon-Sushi/Sashimi (2pcs./person) Summer Rolls or Spring Rolls California or Philadelphia Roll Spicy Tuna or Shrimp Tempura Roll Sundae Roll Ask how to upgrade this package with one of our executive sushi chefs and mobile sushi case. Let our sushi chef entertain your guests with preparation at your venue. Our professional coordinators will set-up, assist the chef and guests, as well as clean-up for added convenience. This package is good for mid-sized parties or late-night meetings. The Dragon features our most popular items along with a couple of our signature rolls to satisfy beginner to intermediate sushi eaters. Package includes: Edamame Ahi Tower Tuna and salmon-sushi/sashimi (2pcs./person) Summer Rolls or Crispy Spring Rolls Chicken or Beef Skewers California or Philadelphia Roll Rainforest or Firecracker Roll Rock Manhattan Roll Ask how to upgrade this package with one of our executive sushi chefs and mobile sushi case. Let our sushi chef entertain your guests with preparation at your venue. Our professional coordinators will set-up, assist the chef and guests, as well as clean-up for added convenience. A great crowd-pleaser no matter the event, The Sumo is our heavy hitting package that has something for everybody. This package has a great selection of our gourmet signature rolls, as well as traditional favorites. There are so many amazing tastes and textures in this package, you can't go wrong. The package includes: Edamame Ahi Tower Stuffed Jalapenos or Stuffed Soft-Shelled Crab Tuna or Salmon Tartar on Crispy Rice Tuna, Salmon and Yellowtail- Sushi/Sashimi (1 pc. each/person) Sundae or Titan or Cherry Roll Volcano or Crabmeat Dynamite Roll Rainforest or Samurai or Rock Manhattan Shrimp Tempura or Spider Roll Ask how to upgrade this package with one of our executive sushi chefs and mobile sushi case. Let our sushi chef entertain your guests with preparation at your venue. Our professional coordinators will set-up, assist the chef and guests, as well as clean-up for added convenience. Many elements can make food a pleasurable discovery rather than simply something to eat. At City Kitchen, we dedicate ourselves to produce the highest quality and most innovative items for your event. Not only are we providing our clients with delicious food but a creative expression that will heighten the joy of your guests. Precise and exceptional. These are words that come as second nature to our dedicated staff. Our staff takes great pride in the individual effort of providing service that brings a worry free smile to you. City Kitchen excels in the opportunity to make our fine food the focal point of your event. Happy Hostess is a full service catering company located in the heart of DFW. We are a scratch Southern Kitchen featuring tried and true favorites of the South, as well as new flavors sure to please you! We are founded on the principle that good food should be made from the freshest of ingredients with no preservatives or additives. We love to do weddings, corporate events and even small at home parties. Chef Laura, the owner, attends each event to ensure that your expectations are met and our clients are happy! Bon Appetit!